This weekend there will be 13 waterfront open houses in and around Annapolis. 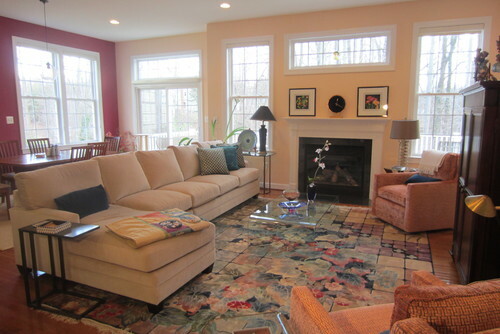 On the list is147 E. Bay View Drive as part of the Annapolis Luxury Home Tour. This resort-like home on the Duvall Creek is listed for $1,399,000 and is the entertainer's dream and minutes from downtown Annapolis. Currently there are 120 properties in our area for $1M or higher. Property featured above: 147 E. Bay View Drive in Annapolis, MD, 21403. Enjoy sunrise views over Duvall Creek from this gorgeous home just minutes from downtown Annapolis. Walls of windows, bright open kitchen, vaulted ceilings, main level master, newly renovated master bath 2 family rooms and stone hearth fireplace. Entertain by the waterfront pool and hot tub. Private pier with 2 jet ski lifts and 2 boat lifts. Currently there are 37 waterfront properties for sale in our area that have come on the market in the past 30 days. They range from a 3 bedroom, 2 bath cottage in Woodland Beach on the South River for $269,900 to a 6 bedroom, 7 bath French Country style home in Wimbleton Farms on the Chesapeake Bay for $5,995,000. Click the image to see them all. They specialize in Interior Design and Decorating services and have been Interior Designers for over 20 years. They are located in Annapolis, Maryland and serve Annapolis and the surrounding area. "We love what we do and a happy and satisfied client is our goal. As indicated in our company name FLAIR INTERIOR DESIGN, we have a "flair" for Interior Design." Designer of the Week | Woodfield Landscaping, Inc.
Woodfield Landscaping Inc. is a full service landscaping company in Maryland specializing in design and building. They offer you a complete and professional design as well as manage the entire installation process. Their cutting edge landscape designs will help you turn your dreams in to reality. Their dedicated designers will help walk through the process of creating the outdoor living space that you could only dream of. They don’t want your project to just be beautiful, they want your home to be admired. They will enhance the beauty of your property while creating a functional outdoor living space and when they leave your home, they will leave paradise behind. Click HERE or on image above to be redirected to their website. Photo courtesy of Woodfield Landscaping, Inc. Currently, there are 13 homes for sale in Eastport from a trendy 1 bedroom, 1 bath waterview condo for $349,000 to a 4 bedroom, 3 1/2 bath architect's dream for $1,795,000. The information provided is from the multiple list service and neither suggests nor infers that Travis Gray or Coldwell Banker participated as either the listing or cooperating agent or broker in the sale or purchase of properties depicted.e to edit. Currently there are 122 properties in our area for $1M or higher. Property featured above: 803 Coachway in Annapolis, MD, 21401. Click here for more information. Breathtaking sunrise views of the Severn River from this beautiful custom home. Over 12,332sqft, exquisitely renovated in 2008. Gourmet chef's kitchen, home theatre, gym, sauna and steamroom. Gorgeous gunite waterside pool with custom inlays and fountains, spa, two outdoor rooms, and gas fireplace make this an entertainer’s dream. Private deep water pier with 3 slips and 2 lifts. Currently there are 45 waterfront properties for sale in our area that have come on the market in the past 30 days. They range from a 3 bedroom, 2 bath ranch style home in Saunders Point on Pennington Pond for $299.950 to 5 bedroom, 6.5 bath colonial home in Shadow Point on the South River for $6,200,000. Established in 2004, Steve Kahle Architects, Inc (SKA Studio) provides master planning, architectural and sustainable design services. The firm is dedicated to the pursuit of design excellence of which sustainable design is a core component. SKA is a member of the US Green Building Council (USGBC). Recent project work includes Residential, Commercial, Retail and Institutional projects. SKA Studio is located on Randall Street in Annapolis. Currently, there are eight homes for sale in Epping Forest ranging from a 3 bedroom, 3 bath cottage for $439,000 to a 4 bedroom, 4 bath contemporary with sunrise views of the Severn River for $1,235,000. In the past 30 days, one home has sold in the community for $692,500. This weekend there will be 18 waterfront open houses in and around Annapolis. On the list is 705 Glendon Avenue as part of the﻿ Annapolis Luxury Home Tour﻿. Enjoy all the luxuries of modern living and beautiful brand new construction brought to you by Dean T. Builders in the maritime community of Eastport. This sophisticated yet charming craftsman home is a showstopper. There are currently 122 million $ listings in the Annapolis area, with 203 Prince George Street being the featured property this week. Situated on one of the largest lots in the Annapolis Historic District, 203 PG Street is a true diamond in the rough. Local tradition holds that the building is historically known as "The Carriage House to the John Brice, III House at 211 PG (erected 1766)". Behind the facade of this nearly 3500sf home sits a .36AC hidden oasis with endless potential in the heart of downtown. Currently there are 40 waterfront properties for sale in our area that have come on the market in the past 30 days. They range from a 3 bedroom, 2 bath ranch style home in Saunders Point on Pennington Pond to 5 bedroom, 6.5 bath colonial home in Shadow Point on the South River for $6,200,000. You can reach them at 703.431.8400 or by clicking the image above. Currently, there are seven homes for sale in the Downs, ranging from a 5417 sqft, 5 bedroom, 5 1/2 bath Colonial home listed for $950,000 to a stunning 12,332 sqft, 6 bedroom, 8 1/2 bath waterfront French Provincial home with breathtaking water views listed for $4,995,000.